Learn Bridal makeup tips by starglamours. 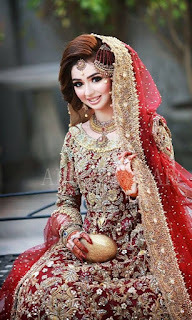 Every girl has a desire to see that she looks very beautiful in her marriage. And the beauty of the bride prompts makeup Generally, in a desire to look beautiful and most different at the wedding, a thick layer of make-up is made on the face of the bride, that the face of the bride seems to be white with makeup. So keep in mind that the bride should be made to do such a make-up, which will keep her look clean and not change her look. And this makeup should be consistent with the occasion. You should take care of certain things for the bride to be properly groomed. Let us tell you about some such tips. Bridal booking should be done 4 to 5 weeks in advance so that beauty experts can give you information related to your skin. Do makeup to enhance beauty and not to suppress its reality. If your wedding is at the time of the day then the makeup is a bit lighter and if at night then make the makeup a bit darker. Make face treatment before make-up. Make sure the skin's groome before makeup. Grab a blush after watching the skin tone and dress. While making eye makeup, place the Foundation on the eye. From this, eyes will look beautiful. Foundation always take a tone white with skin tone. Make eyebrows makeup after complete makeup. Transparent mascara on the eyelids seems to be eye-catching. The foundation can also be installed in the hands. After the dry pulse powder foundation, apply on the whole face. From this the make-up will last for a long time. May make ice on the face before makeup. Apart from this, make-up remains constant. When making makeup, pay attention to every part of the body. Dirty hands and feet can spoil your beauty. Keep in mind the face texture and color. The color and design of make-up and dress must be symmetric. The combination of make-up and jewelry is also important. Focus more on eye and lips make-up.